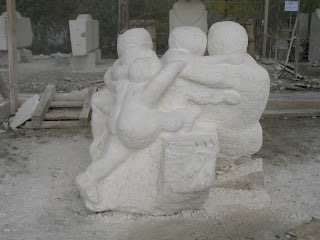 My roommate from France, Pierre created this sculpture, what a great piece for the theme "family". 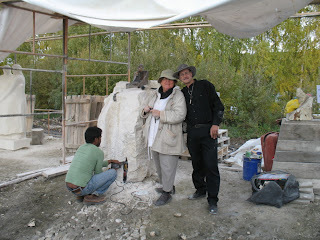 I assisted him the first 10 or so days as well as Barbara from Poland. Amil Ademec from Hong Kong/Chech republic. He's a great guy and has an incredible amount of work placed around the world. His life project is called "Acupuncture the Earth". 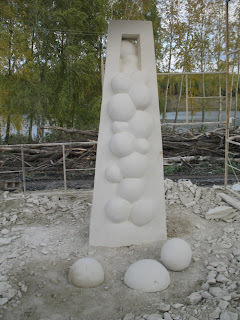 The concept is to place sculptures all over the earth like acupuncture needles and create better feelings of healing. Hope he can do a piece in Canada soon. Moritzio (Italy I think) was the first to complete and had to head off to another symposium about the 20th or so. 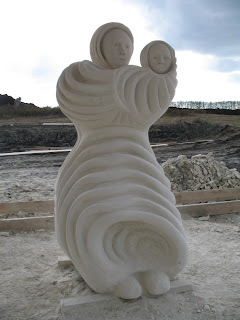 Pretty cool work I think. Wow. That's some of the most beautiful work I've seen to date. You are sooooo lucky to see it firsthand. I thank you again for sharing it here in your blog. Safe travels!